Is this email not displaying correctly? Click here to view in your browser. Now that we have returned from Tokyo to our labs and offices it is fitting to reflect on our 2016 ISER Meeting experiences. By all accounts, the ISER XXII Biennial Meeting was a resounding success. The plenary lectures, platform sessions, and poster presentations were superbly programmed, and were well-attended. The Keio Plaza Hotel was perfectly suited to the meeting, and the views from the poster sessions on the 43rd floor were nothing short of spectacular. Registered attendees numbered 1,020, and represented 39 countries; nearly a quarter of them were Young Investigator or Student ISER members. There were 135 platform sessions (the most ever at an ISER meeting), containing 695 oral presentations. Poster sessions included another 151 presentations. Through its sponsors, ISER awarded 54 Travel Fellowships to facilitate the attendance of Young Investigators. We owe special thanks to the Knights Templar Eye Foundation, the BrightFocus Foundation and the National Foundation for Eye Research for their sponsorship of our 2016 travel fellows. The four ISER prizes and awards, the Endre A. Balazs Prize (to Dr. Reza Dana), the Ernst H. Bárány Prize (to Dr. Lloyd Aiello), the Ludwig von Sallmann Prize (to Dr. Rosalie Crouch), and the Retina Research Foundation’s Paul Kayser International Award in Retina Research (to Dr. King-Wai Yau) were presented and celebrated with exceptional plenary lectures. Additionally, special Recognition Awards were presented to Professors Takeshi Iwata and Takahisa Furukawa, the Scientific Program Organizers for the Biennial Meeting, as well as to Dr. Olaf Straus, ISER’s Meeting Liaison, and Dr. Steven Fliesler, former ISER Councilor, Treasurer, and President. Finally, ISER awarded its first ever Janet L. Denlinger Distinguished Service Award to our current Treasurer, Dr. Christine McGahan, for her tireless and selfless service to our Society in a variety of roles. Congratulations to all of these awardees! When we returned from Tokyo, the first order of business was to finalize the slate of nominees for ISER’s officer elections. We had openings for Vice President, Americas; Vice President, Asia-Pacific; Vice President, Europe; and Young Investigator Representative. The voting and tabulations are complete, and the new ISER officers will be announced soon. Guidelines regarding the election process can be found in the ISER Bylaws. Congratulations to our new officers. Be prepared to get to work! The 2016 ISER Biennial Meeting in Tokyo has finished as one of the most successful meetings in past years. Taking the enthusiasm of this meeting is the perfect time to look into the future for upcoming meetings under ISER’s guidance. Plans are underway to hold ISER’s second “odd-year” ISER meeting topically focused on mechanisms and treatments for glaucoma. The symposium, entitled “Basic Science Catalyzing Treatments for Glaucoma”, will be held in Atlanta, Georgia, at the Emory Conference Center, October 5-7, 2017. The scientific program organizers are Drs. Dan Stamer, Ross Ethier and Rob Nickells. ISER will partner with BrightFocus Foundation to co-sponsor the event. The program will include paper presentations and posters from submitted abstracts that will be placed into larger context by interdisciplinary plenary lectures that present broader perspectives. Confirmed speakers are Drs. Janey Wiggs (Massachusetts), Donald Zack (Johns Hopkins), Ernst Tamm (Regensburg Germany), Susan E. Quaggin (Northwestern University), Balwantray Chauhan (Dalhousie University Halifax Canada) and Leopold Schmetterer (Vienna, Austria). Please save the date and stay tuned for further announcements regarding this upcoming conference. Meanwhile, the date and location have been set for the ISER XXIII Biennial Meeting, which will take place in Belfast, Northern Ireland, September 9-13, 2018. This will be the ninth time an ISER Congress/Biennial Meeting has been held in Europe, but first time ISER has held a meeting in the United Kingdom. The local organizers are Drs. Alan Stitt of Queen’s University, Belfast, and Roy Quinlan of Durham University. ISER members will be solicited for platform session topics in late Spring 2017; watch for email announcements. We look forward to another outstanding Biennial Meeting. These meetings show a great success of ISER’s goal to bring together researchers in vision science on a broad, international level. I hope that the concept of interdisciplinary exchange in organized sessions as a unique feature of ISER’s Biennial Meeting will continue this success, as we experienced it this year in Tokyo. I am very grateful and honored for having the opportunity to serve as the Young Investigator Representative for the last two years for the International Society for Eye Research (ISER). In regards to the specific objectives of ISER meetings, I would like to note that the 2016 ISER Meeting in Tokyo, Japan, has been one of the most successful ones thus far. The interaction and collaboration between Young Investigators was inspiring, yet in a very informal and enjoyable environment. This is perhaps because ISER committee members, program chairs, and session organizers worked hard to organize the events and plan stimulating topic presentations that covered a wide range of eye research that enhanced everyone’s knowledge, especially our Young Investigators. I am glad that for the very first time this year at the ISER 2016 meeting in Tokyo, Japan, we had an opportunity to have an early welcoming ceremony for the 54 Young Investigator Travel Fellowship Awardees, an exciting and successful Young Investigator Poster Award Competition for our poster sessions, with cash prizes awarded to the winners and a new blog called “Young Investigator Synopsis” under Eye2Eye listserv for exchanging our ideas and providing feedback during the meeting. These new events supporting the Young Investigators would not have happened without the ISER committee members’ support and their guidance along the way. On behalf of Young Investigators, I would like to express my heartfelt gratitude and sincere thanks to all those who made this events a reality, especially our ISER president, Dr. John Penn, our meeting management liaison, Dr. Olaf Strauss, our staff, Ms. Amber Mendez and last but certainly not least, the Travel Fellowship Award Sponsors, The Knights Templar Eye Foundation, BrightFocus Foundation, National Foundation for Eye Research and ISER for their endless support and encouragement for Young Investigators. I'm always looking for other opportunities to help and organize ISER meetings because I know we have such a strong support system, open to suggestions wherein every member has been given the opportunity to participate and to convey his/her viewpoints, as I experienced myself. The ISER conference is a success because of your efforts and participation. Thank you and till we meet again in Belfast 2018! Your 2017 membership dues can now be paid online or by mailing payment. Please pay your membership dues no later than December 31, 2016 to avoid an interruption to your membership benefits. Attending the biennial meetings provides great opportunities to meet international experts in your fields of research, to establish collaborations and investigate employment options. It is a great honor to have recently joined the ISER Fundraising Committee. First, I would like to thank Dr. John Penn for giving me this opportunity to continue serving our Society from this new perspective. I also thank Dr. Ernst Tamm, past Chair, and all the members of the committee for their excellent work raising funds to allow, among other activities, the endowment of so many YI travel fellowships to attend ISER 2016 in Tokyo (by the way, thank you Dr. Takeshi Iwata and Dr. Takahisa Furukawa for putting together such an outstanding scientific program!). Thanks also to KIT Group, T-Mark and all the companies and foundations supporting our 2016 Biennial Meeting, highlighting the Knight Templar Eye Foundation (once again, thank you John for your efforts!). Following our goal, the Fundraising Committee continues its work, now focused on raising funds for the forthcoming 2017 odd-year meeting and the 2018 biennial meeting. In doing so we hope not to be alone and invite all ISER members with contacts with industry, associations or individuals with vocation of patronage, to collaborate creating liaisons between them and ISER, thus enabling the growth of our Society, and especially supporting our Young Investigators. Please contact me directly if you can contribute to our fundraising efforts. ISER's Eye2Eye Discussion Forum is an open forum where ISER members can ask a question, request feedback, and discover new resources! Find out how others are resolving challenging issues, contribute to your colleagues' body of knowledge, and expand your own knowledge through shared experiences and ideas. Get connected! Follow ISER on Facebook, Twitter and LinkedIn! And see below for the Eye Photo of the Quarter, brought to you by ISER’s Communication Committee! 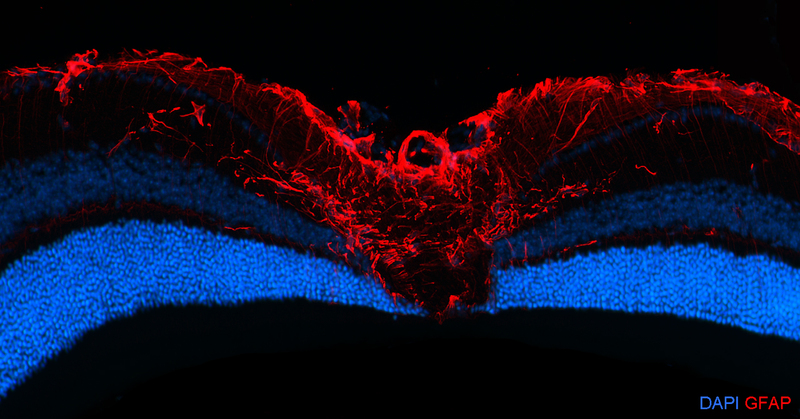 Immunofluorescent staining of retinal cross section from a mouse eye subjected to retinal ischemia / reperfusion injury. This section was immonostained for glial fibrillary acidic protein (GFAP) (red) and couterstained with DAPI to stain nuclei (blue). If you have a photo to be considered for this featured spot, please submit your scientific image, along with a figure legend, by clicking the link below. Over the past year or so, my lab (at the University at Buffalo- State University of New York, Jacobs School of Medicine and Biomedical Sciences) and that of Dr. Claire Mitchell (at the University of Pennsylvania, School of Dental Medicine) were the first to engage in this new program. 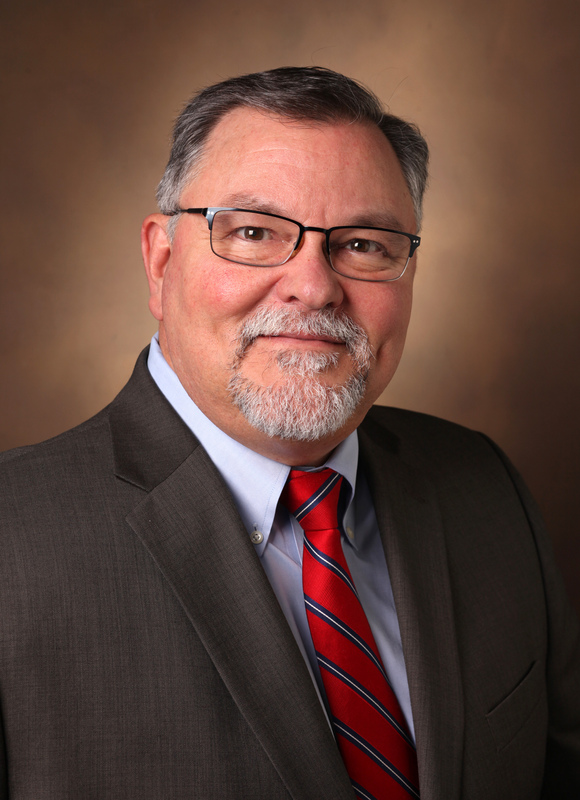 Dr. Mitchell and I entered into a collaboration that involved sending a graduate student from my laboratory (Mr. Sriganesh Ramachandra Rao) to her lab to learn a variety of cell biological methods pertinent to the study of autophagy in cultured RPE cells. In return, she sent a postdoctoral fellow (Dr. Nestor Mas Gomez) from her lab to mine, to learn some fundamental aspects of lipid biochemistry and quantitative lipid analysis. As the supervising mentors, Dr. Mitchell and I each covered the associated travel and housing costs for our respective trainees. This inter-laboratory collaboration turned out to be extremely productive and successful, with each trainee expanding his repertoire of lab-based skills well beyond what either had known prior to the lab exchange. As a result, our trainees presented their collaborative research as first-author posters both at the 2016 ARVO Annual Meeting (in Seattle, WA, USA) and at the 2016 ISER Biennial Meeting (in Tokyo, Japan). 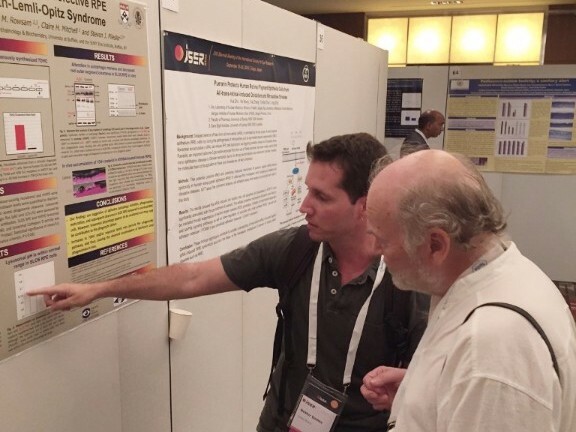 As an incentive for labs to engage in this exchange program, the registration fee for the presenting trainee is waived at the ISER Biennial Meeting where the results of the inter-lab collaboration are presented, while the meeting registrations fee for the participating Principal Investigators is reduced by half. I highly encourage other ISER member Principal Investigators and their trainees to participate in this very rewarding educational and mentoring initiative. For more details, please contact Ms. Amber Mendez in the ISER Office (amendez@aao.org). 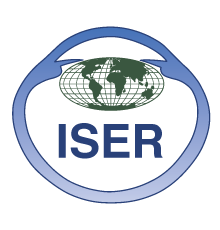 ISER members can post and view career opportunities on the ISER website. To request a career opportunity be posted on the ISER website, please email your request to the ISER Secretariat at mail@iser.org. Postings remain live for 90 days, or until the position has been filled. Visit the ISER Career Center for complete details. Please pay your 2017 membership dues no later than December 31, 2016 to avoid an interruption to your membership benefits. You can pay online using a Visa, Mastercard or American Express. Contact the ISER office if you need assistance. (L-R). 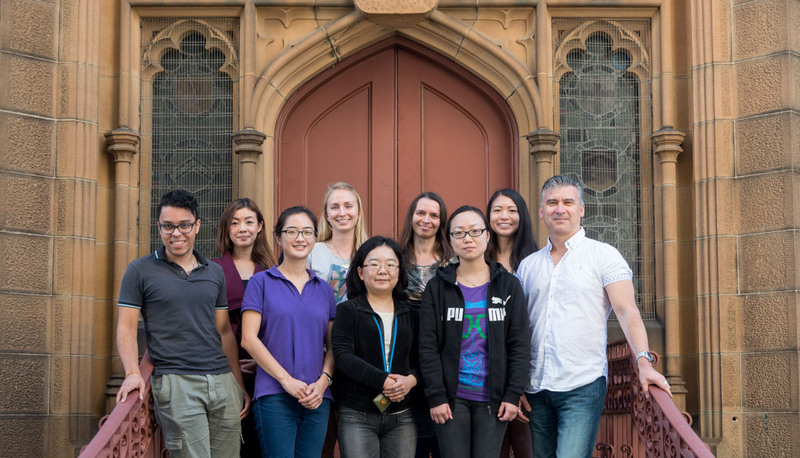 Shannon Das, Tammy So, Daisy Shu, Magda Wojciechowski, Yuki Sugiyama, Lucy Dawes, Guannan Zhao, Alyssa Susanto, Frank Lovicu. (absent, Emma Collinson, Fatima Wazin). Dr. Frank J. Lovicu is a Professor based in the School of Medical Sciences in the discipline of Anatomy & Histology, Bosch Institute and Save Sight Institute, at The University of Sydney, NSW, Australia. He is one of the current Vice-President’s of ISER, representing Asia-Pacific, and is also a Fellow of ARVO. He heads the Lens Research Laboratory that primarily carries out research in experimental cell and developmental ophthalmology, mainly focusing on understanding the mechanisms of inductive cell and tissue interactions and their roles in differentiation and development. 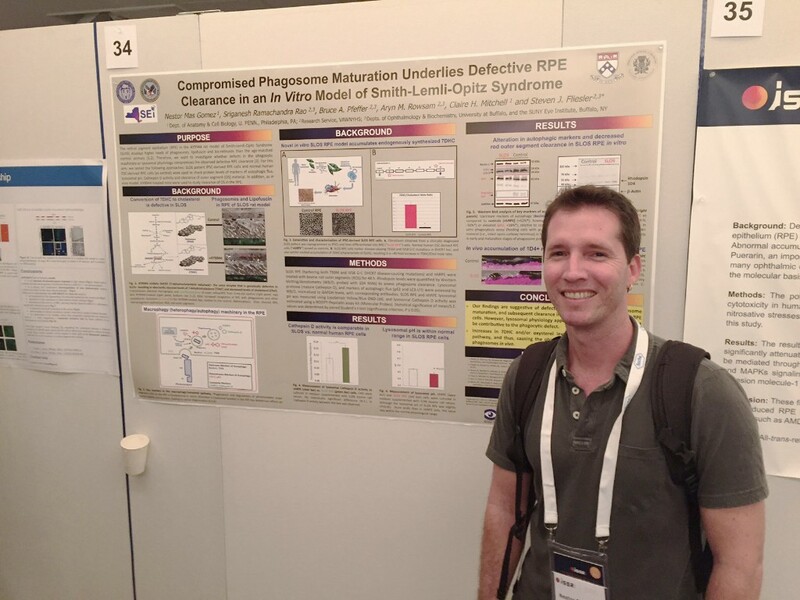 Using the vertebrate ocular lens as a model, research carried out over the last 25 years has primarily contributed to the understanding of the normal and pathological developmental biology of the lens and the role of growth factor signaling pathways as mediators of inductive interactions between cells and tissues. Through a long standing collaboration with the recently retired Professor John McAvoy, the laboratory has invested much time in understanding the role of FGF and other ocular growth factors, in regulating normal cellular processes that are integral to normal development, growth and maintenance of the mammalian lens. Using a well established rat lens epithelial explant system, together with molecular genetics, adopting transgenic mice that were first introduced to the laboratory through training in the Overbeek laboratory at The Baylor College of Medicine, USA, studies have mostly focused on growth factor signaling in regulating lens cell behavior, leading to normal lens development and growth, as well as that leading to and regulating cataract. The research of the laboratory has highlighted the important role of MAPK/ERK1/2 signaling in FGF-induced lens cell proliferation and fiber differentiation, more importantly how the differential responsiveness of lens cells to different doses of FGF is regulated, not only by the levels, but by the duration of ERK1/2 signaling. This led to the identification of negative regulators of receptor kinase signaling (including ERK1/2) in lens, namely members of the Sef, Sprouty and Spred families. While Sef was demonstrated to be a specific antagonist of FGF-induced lens fiber differentiation, Sprouty members were shown to be important for maintenance of the lens epithelium with age. Mice deficient for Sprouty were shown to develop anterior subcapsular cataract, similar to that induced by Transforming growth factor-beta (TGFß) in transgenic lines of mice, as well as that normally seen in human pathology. These fibrotic forms of cataract are driven by an epithelial to mesenchymal transition (EMT). This key cellular mechanism is thought to be primarily driven by TGFß, not only in cataract, but in many other fibrotic pathologies. The laboratory effectively showed Sprouty expression in lens epithelia to be required to prevent TGFß-induced EMT leading to cataract, with overexpression of Spry in transgenic mice lens preventing TGFß-induced cataract formation. Stimulation of cells by TGFß leading to EMT and subsequent cataract is regulated intracellularly by different signaling pathways including the canonical Smad, and non-canonical ERK1/2 pathways. These pathways are thought to potentially crosstalk, and together lead to a number of different EMT features, including loss of the epithelial phenotype, myofibroblast cell differentiation, extracellular matrix (ECM) accumulation and also aberrant redox signaling. A number of studies have shown that these TGFß-mediated pathways can be regulated by many different means, such as by other growth factors, ECM proteins and modulators, and intracellular antagonists such as members of the Sprouty family. Our ongoing studies plan to examine the modulating effects of these different factors on the downstream signaling pathways regulating TGF beta-induced EMT in lens epithelial cells. By establishing a better understanding of the molecular mechanisms that drive EMT in lens, this will lead to more effective means of controlling fibrotic pathologies, and subsequently open up possibilities for the development of novel non-invasive therapeutics for human cataract. If you would like to submit a Lab Profile for a future ISER Eyes on The World issue, please email mail@iser.org. The inaugural Summit will bring together researchers, regulators and other stakeholders in a revolutionary approach to advancing innovation in the diagnosis and treatment of eye disease. The Summit will highlight bench-to-bedside research which has the potential to translate into viable medical products. Please note that registration is separate from and in addition to registration for ARVO Asia 2017. Register for ARVO-Asia 2017 by Dec. 12, 2016 and save up to $220. Book online to receive special rates at select hotels and apartments in the Brisbane area. Accommodations are available to fit any budget. All hotels are accessible to the conference venue and provide a comfortable and enjoyable stay for attendees. Copyright © 2016 International Society for Eye Research, All rights reserved.